mon petit lyons: Modern Mini Challenge Day! OK friends- the big day is here! 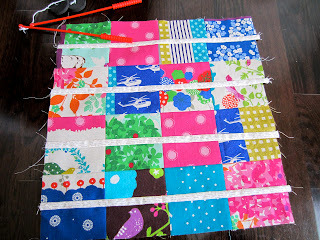 I’m super excited about this fun, new sewing contest- the Modern Mini Challenge at Ellison Lane Quilts. How about a quick project that sparks your imagination? Want to try a new technique or use some of your treasured favorite fabrics? Then the Modern Mini Challenge is exactly what you need! This is my newest Modern Mini, Between the Lines, with a mini-tute to follow the information on the Modern Mini Challenge below. The Modern Mini Challenge is a 5 week series that kicks off with some seriously inspiring work from some super talented bloggers. Spark your creativity with ideas and inspiration from some amazing mini quilts and mug rugs. Get ideas flowing for color, fabric, technique and style. This is your opportunity to try something new, something fun, something on a small scale. Take that big idea and give it a try in mini form. Bloggers share their modern minis and kick-start your creativity. Get inspired, get creative, get those ideas flowing! Weeks 3 & 4 - Sew. Sew. Sew! Work on those minis and create your Modern Mini Challenge piece. Week 5: Enter the Contest! 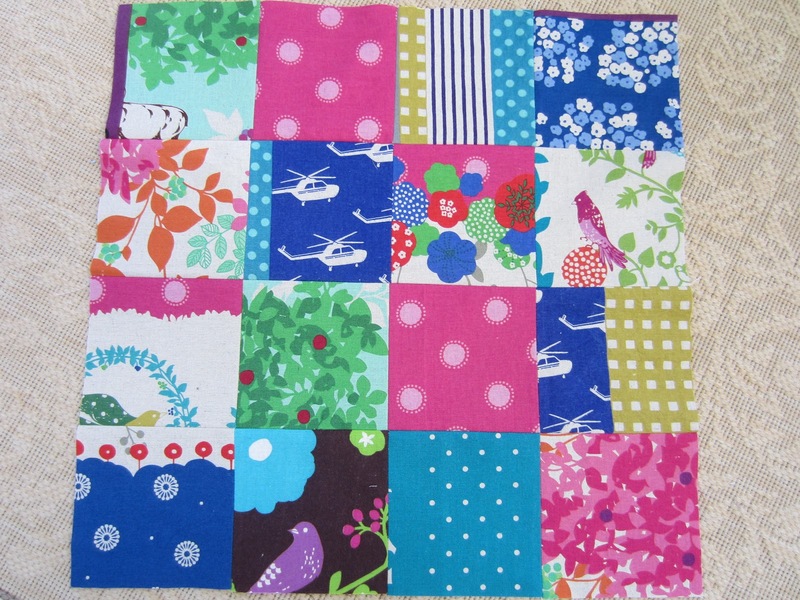 Link up your Modern Mini Challenge piece at Ellison Lane Quilts. Voting begins that week and winners are announced on March 9th! 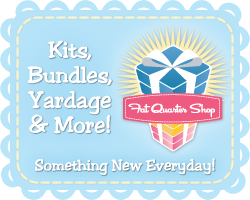 A BIG THANKS goes out to Kimberly at the Fat Quarter Shop for generously sponsoring all five of our fabulous prizes. So what are those fabulous five prizes? Hold on to your hats! Both Viewer’s Choice Winners will receive a fat quarter bundle of the FULL LINE of Flea Market Fancy reprint by Denyse Schmidt. 2/11: Sukie, Don't You Know Who I Am? Contest Requirements: 1. Create a modern mini quilt or mug rug - only one entry per person 2. 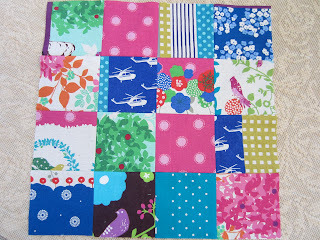 Enter your mini quilt or mug rug in the linky party at Ellison Lane Quilts on Monday, March 5. You do NOT have to have a blog to enter. You may link a picture from your Flickr account. 3. Your entry (blog post or Flickr description) should include the size of the item Now, grab a button and go get started! To begin you will need to make a patchwork base. 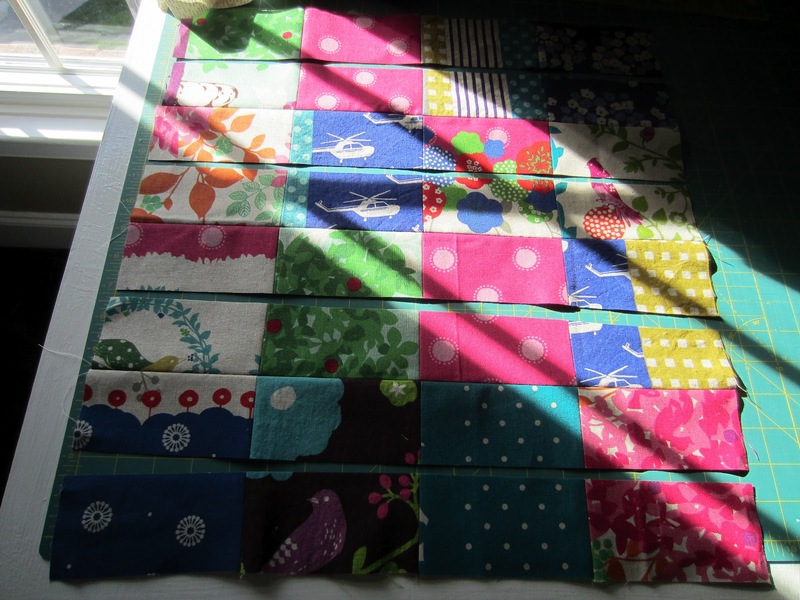 I used sixteen 5" charm squares in various Echino fabrics. I use a 1/4" seam allowance throughout the tutorial. Now take a deep breath and cut through the center of each row. Should be 2.25" from the seam lines. Cut very carefully, as you need both sides to put back together! Next you will need a 1" strip of text fabric to sew in between each piece you cut, mine measured 20" long, because I'd rather trim than be short! Now you will make a slice through the center of each column and follow the steps above to insert the 1" strips of text fabric. Continue to baste, quilt and bind as you like I did random straight line quilting with my hera marker and bound in Echino scraps. I hope you enjoyed this little tutorial! Thanks so much for stopping by today! It's a beauty - great tute, and anything with both text and Echino can't go wrong!! Thanks for the tute, I will definitely try this. Super cute mini - thanks for the tute! This is great, Courtney! I am thinking this might be cool with some of the charms from the I spy swap!